Over the past 20 years, many western Canadian farmers have shifted to no-till or minimum tillage. During this time, the amount of summer-fallowed land has declined to the point that over 90 per cent of cultivated land is continuously cropped each year. 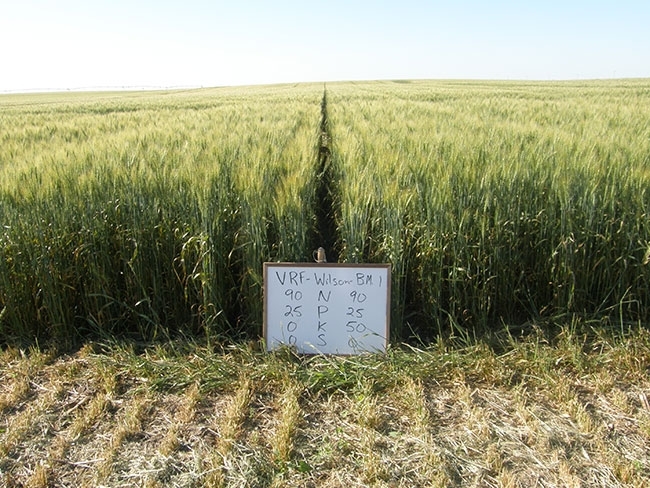 Direct-seeded wheat in a mid-slope field position fertilized with NP versus NPK. How no-till affects fertilizer management. This dramatic shift to no-till or minimum tillage, coupled with continuous cropping, has elicited significant increases in soil organic matter (SOM) and improved soil quality across the Prairies. Additional benefits of reduced tillage include increased stored soil moisture, improved water infiltration, improved soil structure and improved soil aeration. No-till can also affect spring soil temperature and soil nutrient stratification. Generally, these combined benefits increase crop yield potential. However, to achieve optimum yield, farmers must pay increased attention to soil fertility and fertilizer management of their no-till fields. Some nutrients will gradually accumulate in certain areas or layers in the soil profile in no-till and reduced tillage systems. This stratification is normal. Nutrient stratification results from methods of fertilization application, crop root uptake of nutrients and breakdown of crop residues. In no-till systems, most farmers use a combination of seed-placed and side or mid-row banded fertilizers. Phosphorus (P) and potassium (K) fertilizers are relatively immobile, and if not taken up by plant roots, they mostly remain where they are placed. For example, when P fertilizer is seed-placed year after year, P will accumulate in the zone of placement. In contrast, nitrogen (N) and sulphate-sulphur (SO4-S) fertilizers are more mobile and are less likely to accumulate. Plant roots extract soil nutrients and water throughout soil zone explored by the roots. This results in nutrient depletion throughout the root zone. In no-till systems, above ground plant residue remains on the soil surface and gradually decomposes, releasing nutrients into the surface soil and creating a nutrient rich layer. Rather than worry about nutrient stratification, the best thing is to ensure excellent soil sampling procedures are used to identify the amount and location of each nutrient. The greatest benefits of no-till are increased SOM and improved soil quality. Research studies and farmer experience show that higher N fertilizer rates are often needed for optimum crop yields in the early years after shifting to no-till. What most farmers and agronomists don’t realize is that it takes additional N fertilizer to build SOM. Higher rates of N will increase yield, which also means more root material and crop residues are added to the soil, which contributes to more SOM accumulation. A study on nutrient management in no-till and minimum-till systems from Montana State University suggests it takes about 1,000 pounds of N per acre above normal crop requirements over a number of years to increase SOM by one per cent. This assumes a SOM to N ratio of 20:1 in the top six inches of soil. The extra nitrogen isn’t added all at once, but added over time, likely decades, according to the 2008 study. Generally, research across the Prairies has shown crop yields on no-till have been higher than conventional till over a range of N fertilizer rates. Differences are often greater in drier years due to increased soil moisture conservation because the elimination of tillage reduces soil moisture loss and increases water infiltration. The surface residue also reduces moisture evaporation from the soil surface. These factors increase crop yield potential and N fertilizer is used more effectively versus conventional tillage. Various Prairie research studies comparing no-till versus conventional till soils show that additional N is needed for at least 15 years after shifting to no-till. Including pulse crops such as pea in a crop rotation can help to reduce the need for higher N requirement of no-till because these nitrogen-fixing crops help add nitrogen back into the soil when they become residue. After 10 to 15 years of no-till, SOM will gradually contribute to increased soil N mineralization, which increases plant available soil N and contributes to increased crop yields. In the longer term, additional N fertilizer usually is not needed to optimize yield in no-till cropping systems as soil organic matter increases to a new equilibrium or steady state, which mineralizes addition N.
As SOM increases, increased mineralization of available N needs to be considered to determine optimum N fertilizer required in no-till fields. Alberta research has shown that soil test N and potentially mineralizable N must both be considered to accurately predict N fertilizer requirements. Soil testing labs can estimate potentially mineralizable N by incubating a soil sample but generally, lab results are not well correlated with N mineralization in the field. Unfortunately, the amount of N that is mineralized in a field varies from year to year due to previous crops in the rotation and environmental conditions. A more reliable method to determine mineralization is to leave unfertilized check strips in fields and measure crop yield. On-farm conducted check strips will take into account effects of previous crops, plant residues, volatilization, denitrification and immobilization over the growing season that cannot be determined in the lab. By knowing your soil test N level and crop yield in check strips, accurate estimates of N mineralization can be calculated. By conducting on-farm trials, reasonable field estimates can be made of N mineralization for specific fields. If you have fields that have been direct seeded for more that 20 years, odds are you will be pleasantly surprised at the amount of N your soils can mineralize. Some labs and agronomists will estimate N mineralization based on SOM percentage. This can be helpful, but research across the Prairies has generally shown a poor correlation between percentage SOM and N mineralization. Therefore, this method does not provide a very reliable estimate of N mineralization. Nitrogen fertilizer should be side or mid-row banded at the time of planting for the best uptake efficiency in no-till fields. When using urea, place N about 25 to 50 millimetres (mm), or one to two inches, beside and 25 to 50 mm (one to two inches) below the seed row to minimize germination problems. To minimize N volatilization, N fertilizer bands should be 75 mm (three inches) below the soil surface. Volatilization can be a concern when urea bands are less than 50 mm (two inches) below the soil surface. No-till fields tend to have lower soil test N levels versus convention tillage. No-till soils are usually seeded earlier than conventionally seeded fields; meaning seedbed temperature is often colder. To offset this, some starter N in the seed row may be beneficial to ensure N is adequate for earlier seedling growth. Broadcast urea on conventional till tends to produce higher yields versus no-till. Urea broadcast onto no-till field is more easily immobilized or lost by volatilization as higher amounts of crop residue on the soil surface can enhance N tie-up and volatilization. 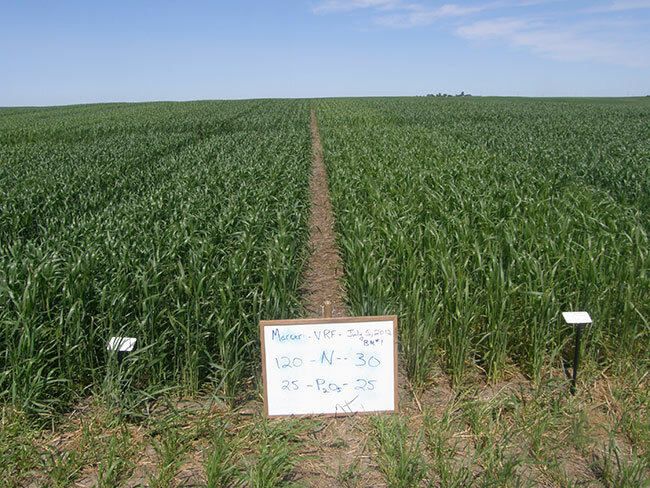 Direct-seeded wheat in a mid-slope field position fertilized with NP versus NPK. As mentioned, no-till systems can result in greater stratification of soil nutrients. Seed-placed P fertilizer application can lead to increased concentration of available soil P in the 25- to 75-mm (one- to three-inch) soil depth. Research has not shown any significant differences in P uptake and crop yields because of P stratification in no-till soils. In the zero- to 50-mm (zero- to two inch) soil layer, K levels are often greater under no-till than conventional till. High amounts of K naturally occur in crop residue. Potassium in crop residue is in inorganic form and leaches out of the residue into surface soil. But, K is positively charged and is not very mobile in soil and becomes concentrated in the top 50 mm (2 inch) soil zone. Potassium fertilizer that is side banded at 50 to 75 mm will tend to remain at this depth. Despite K stratification, research has not shown any significant differences in K uptake and crop yields in no-till soils. Stratification of sulphate-sulphur does not seem to occur due to no-till cropping. Often in Brown and Dark Brown soils there is the accumulation of sulphate in subsoil as calcium sulphate, but this is due to natural soil forming processes over several thousand years. Generally, rates of P and K fertilizer in no-till cropping systems do not need to be adjusted due to soil stratification. Fertilizer rates should be based on soil test level and target yield. To offset P and K stratification, farmers could use a combination of seed-placement, and side or mid-row banding of P and K fertilizers. Side or mid-row banding P and K about 50 mm (two inches) below the seeding depth may help promote slightly deeper root development and widen the zone of nutrient stratification. Deep banding or placement of P or K fertilizer in separate operations can disrupt earthworm channels and other natural bio-pores that have formed due to no-till. Deep banding is disruptive on soil aggregates that have formed after years of no-till and could cause tillage soil compaction. Deep placement may not be an agronomically or economically wise practice. To accurately determine soil nutrient levels, greater attention to soil sampling is necessary in no-till fields to account for nutrient stratification and fertilizer bands. More soil samples must be taken to accurately characterize a no-till field or management zones. Some research suggests that about 40 samples per composite are necessary in no-till versus 20 samples in conventional till. Taking soil samples from the zero to 15, 15 to 30 and 30 to 60 centimetres (zero to six, six to 12 and 12 to 24 inch) depths are helpful to examine soil nutrient stratification. The best approach for nutrient management in no-till cropping systems is to use the 4R philosophy (right source, right rate, right time and right place). Apply adequate rates of the required nutrients based on soil testing. Ideally, for cereal and canola crops, seed-place P fertilizer at the safe rate and apply N, K and S in side or mid-row bands at the time of planting. If possible, place the side or mid-row bands about 50 centimetres (two inches) below the seeding depth. In-crop applications of N should be done with caution to minimize potential losses. Is tillage of no-till required to improve nutrient distribution?